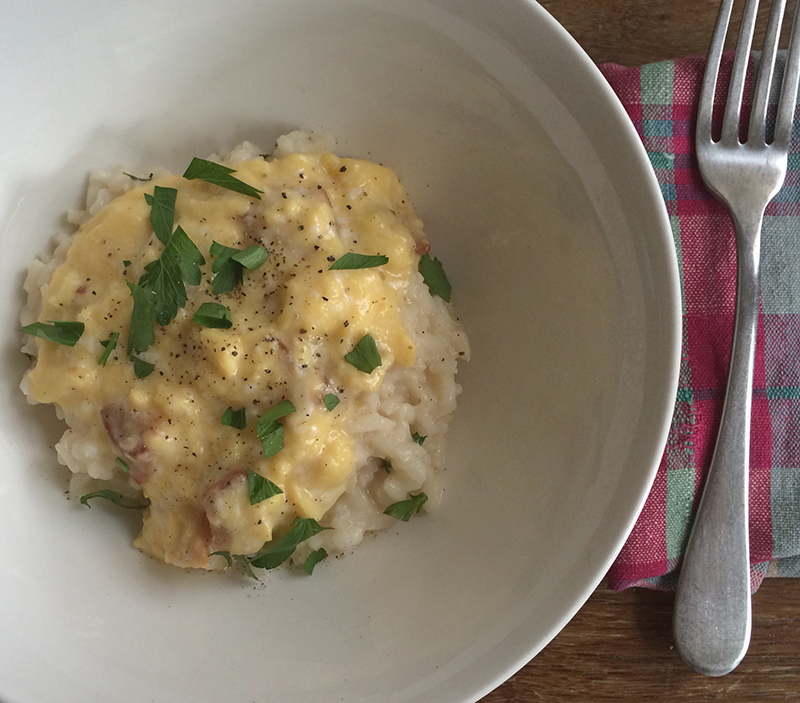 Revive leftover risotto with custardy soft scrambled eggs and crispy bacon to make this warm and comforting Sunday breakfast. Butter, rice, onions, chicken stock. Because they are so few, the ingredients you use for your risotto make a huge difference in texture and flavor. I think the most important key to delicious risotto is the stock. It is worth the effort to make slow-cooked homemade chicken stock to have on hand. Canned or store-bought chicken stock has little to no body and always tastes like the can or package, a flavor that only intensifies as it reduces and cooks into the risotto. Homemade chicken stock has a cleaner flavor and cooking down the gelatin from the bones adds body and richness. The second most important ingredient is the rice itself. Arborio rice is widely available and makes a very good risotto. But once you try Carnaroli rice, you will never go back to Arborio. The long grained, firm textured rice has a higher starch content and makes a far superior risotto. Carnaroli makes risotto with pleasantly toothy grains, while its starch lends the broth an extra creamy texture. FInally, be sure to use good fresh cream butter, and cook the onions slowly to bring out their natural sugars and sweetness. 1. In a medium saucepan, heat the chicken stock and keep hot over low heat. 2. In a wide saucepan or dutch oven, melt butter and saute onions over medium heat until translucent. 3. Add the rice to the pan and toast lightly for about 5 minutes until the grains are shiny and slightly translucent. 4. Add the white wine and cook until completely absorbed. 5. Add enough of the stock to just cover the rice and stir vigorously until the liquid turns cloudy. Cook until the liquid is almost absorbed, stirring intermittently to keep the rice from sticking. 6. Cover the rice again with more hot stock, and cook and stir until it is almost absorbed. Continue adding stock and stirring until the rice is tender but still firm (al dente), and there is just enough liquid so the rice has a porridge like consistency. 7. Fold in fresh picked thyme, grated cheeses, parsley, and salt and pepper to taste. Cover and keep warm while you prepare the eggs. If the risotto becomes to dry, you can add a little more stock and butter just before serving. 1. Combine butter and eggs in a cold medium saucepan. 2. Cook over medium heat, stirring continuously and moving the pan off and on the heat as needed to keep the eggs from overcooking. Soft scrambled eggs resemble the texture of runny cottage cheese or ricotta. 3. Season eggs to taste with salt and pepper. Then fold grated cheese and creme fraiche into hot eggs. Serve over creamy risotto with your favorite topping and freshly chopped herbs. I like to make big batches of risotto and keep the leftovers on hand for a quick meal. To make ahead, prepare the risotto up to step 6 (before adding the cheese and herbs), and cool it quickly by spreading it in a shallow pan or baking sheet. It should keep for 3-5 days. Reheat cold risotto gently in a saucepan or saute pan, adding a little hot chicken stock and butter as needed to make it creamy. Once it is heated through, finish with cheese, herbs, salt and pepper. Tags: Breakfast, Brunch, Eggs, Grains, Rice, Risotto, Slow Food, soft scramble, Technique. Bookmark the permalink.